Recently I have been feeling… blue. I think it’s got to do with a lot of things. But I think the real source of my certain shade of melancholy is rooted in my prayer life. Lately my prayers have felt weak, hard to muster up, and they’ve been lacking… gusto. I need to reexamine prayer. In short, I need a prayer makeover! For this next set of posts, I thought I’d explore the idea and practice of powerful prayer, it’s stipulations, it’s process, and it’s outcomes. First, I want to take a close look at the stipulations or rules of prayer. Now, before I was a true Christian, I totally still talked to God all the time. I never followed any rules about my prayer though, so all I did was talk; I didn’t listen. Communication with God is a two-way street. I didn’t realize that before I was saved. And if someone where to have told me that there were rules for prayer, I would have told them that they were “squashing my spirit” and “limiting my spirituality”… whatever that means. My problem was that I did not read the Word of God (the best place to really listen to God), and because of my lack of Christ’s actual words, I did not abide in Him (which is actually the first rule!). John 15:7 tells us specifically that if we want our prayers heard and answered, we must abide in Christ and Christ must abide in us. What does ‘abide’ mean? Abide means to accept or act in accordance with. So. We must accept Jesus as our Lord and Savior, we must act in accordance to His will and way, and in order to do that, we have to know and study His word. In short, our obedience to His word is highly important when we pray. And because of this fact, guess where we will learn about how to pray? …yep! The Word! In 1 John 5:14-15, God tells us to pray as if we have already received, which is an exercise which strengthens our faith. We need to pray, knowing that God will answer. Why would we ask for something from someone we didn’t think would answer? We need to be confident that our prayers will be answered because we know that our God is faithful. In the same verses (1 John 5:14-15), God also tells us that we must ask according to His own will. This is exactly what Jesus did when He prayed in the garden of gethsemane : Father, if you are willing, take this cup from me; yet not my will, but yours be done.” Luke 22:42. We need to be aware of the fact that God knows what is best for us, and so pray that His will be done rather than our own, which is limited by our own lack of understanding and selfish desires. (Also, if Jesus prayed that way, we probably should follow suite). James 4:3 tells us that a hindrance to answered prayer is greed. If we wish to spend what we receive on our own lusts and pleasures, God will be less likely to hear, much less answer your prayers. Psalm 66:18 explains that if we cherish iniquity in our hearts (in other words, if we have sinful intentions), then our prayers will not be lifted up. Now, sometimes we will make a mistake and pray for nasty things (revenge, excessive wealth, worldly power…). In time, God will reveal to us that our wishes are sinful and with the maturing of our faith, we will learn to pray in a selfless and grateful way. The last and most important stipulation on prayer is one that I never knew about before I became a Christian. You can find it in John 16:24: It is that we must pray in Jesus’ name. As believers in and followers of Christ, and because we belong to Him, we can ask in His authority and on His merit. Just as the Father answered Jesus’ every prayer, so He will answer us when we ask in Jesus’ name. Now, you will notice that these rules of prayer are not my own. 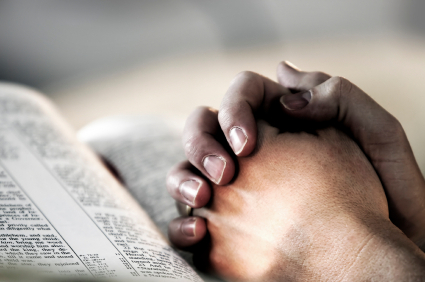 This is how God’s Word–The Bible– actually tells us how to pray. In my future posts, I want to explore the process of prayer even further, in an attempt to strengthen my own prayers and deepen my relationships with the Lord. I also hope that you too will be strengthened and that your own prayer life will grow deeper in the love of Christ. I’m trading my blues for the joy that is completed by answered prayer. Will you join me in doing the same?